A magnificent view of the 4*Heritage Awali Golf & Spa Resortl. 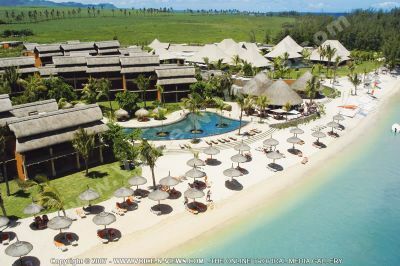 This is a resort on the south coast of Mauritius, between sea and mountain, situated in the midst of lush vegetation. From a birds eye view, you can see the bungalows, the swimming pool, the kiosks and sunbeds on the beautiful sandy white beach, the palm trees and the rest of the Hotels vegetation and reserve.